What Day Of The Week Was February 13? 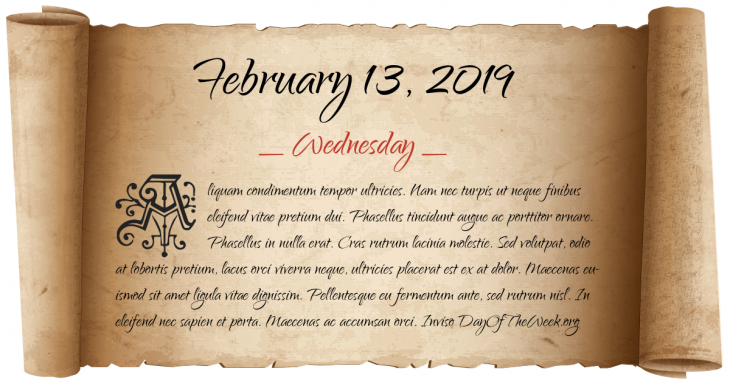 February 13, 2019 was the 44th day of the year 2019 in the Gregorian calendar. There were 321 days remaining until the end of the year. The day of the week was Wednesday. Disfida di Barletta – famous challenge between 13 Italian and 13 French knights near Barletta. Auguste and Louis Lumière patent the Cinematographe, a combination movie camera and projector. New Delhi becomes the capital of India. New Year’s Day in Chinese calendar. Start of the year of the Wood Dragon in Chinese astrology. Konstantin Chernenko succeeds the late Yuri Andropov as general secretary of the Communist Party of the Soviet Union. Who were born on February 13?